Recovering from Back Injury - Center for Pain Medicine, P.A. Following a few simple principles, you can quiet the discomfort, regain a reassuring routine, and propel yourself back into normal activities. Though not uncommon in both the home and workplace, back injuries can be devastating. The physical pain paired with financial and family responsibilities can cause anyone to panic. However, following a few simple principles, you can quiet the discomfort, regain a reassuring routine, and propel yourself back into normal activities. Back pain is not a minor irritation; it is a debilitating condition. There are no bandages or ointments that can distract us – the pain radiates from the inside out and affects each and every movement we make. Sitting, rising from a chair, walking, driving, dressing, showering . . . all of our daily pursuits are dependent on a strong core. When something inside twists or slides out of place, becomes torn or even broken, all of our movements grind to a halt. 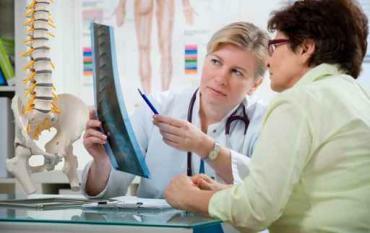 After being properly diagnosed and treated by a pain physician, the road to recovery begins. At this point, the injury is fresh and the surrounding muscles have become tender. Your physician will prescribe the appropriate combination of anti-­‐ inflammatories, muscle relaxers and pain medication. While these medications will not “cure” the injury, they will allow the muscles to stop standing guard around the injury site and relax to facilitate healing. Rest, plenty of fluids, and a progressively substantial, whole food diet provide a foundation for the body’s repair. After the cornerstones of recovery have been laid, the reconstruction can commence. Movements fundamental to daily activities such as cooking, driving, sitting at a desk, household chores and even personal care must all be relearned. Discover and engage core muscles. Exhale upon exertion, such a rising from a chair or a bed. If direct rising is impossible, learn to roll onto your stomach and press your body up with your arms. Lift your body with your legs, keeping your back straight. Rehabilitation should include several complementary components. Stretch passively for increased flexibility. Stretch actively for increased range-­‐of-­‐motion. Strengthen your back and stomach muscles with a program designed by your physical therapist. Continue on your pain medication as directed by your pain physician. Manage stress and eat well to build energy. Finally, consult your pain physician about continued treatments and alternative therapies.